On the south bank of the Thames and right next to Lambeth Palace, the Archbishop of Canterbury’s London digs, is a deconsecrated church. It’s graveyard, carved up like a wedge of cheese by busy road is the resting place of the illustrious in trade and horticulture. There is a prosperous wax chandler, the man who transplanted the bread fruit and famous father and son plant collectors, the Tradescents. 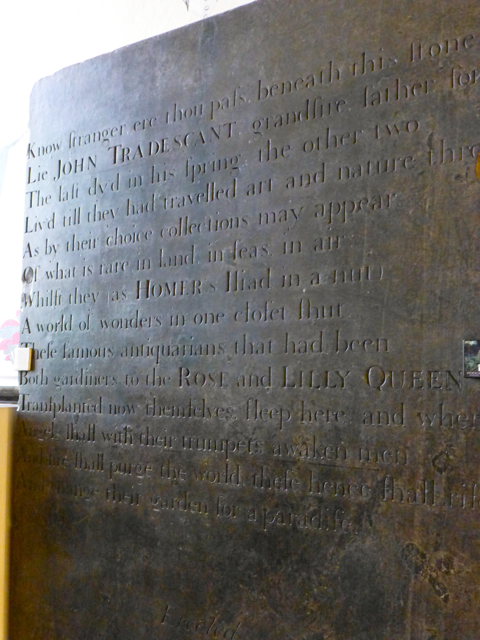 Their tombstone was chiselled and laid in 1665. Now the church and grounds are used for exhibitions and to introduce children to the wonder of plants and gardening. Green Fuse is their small current exhibition and celebrates Dan Pearson’s work. I took my mum. 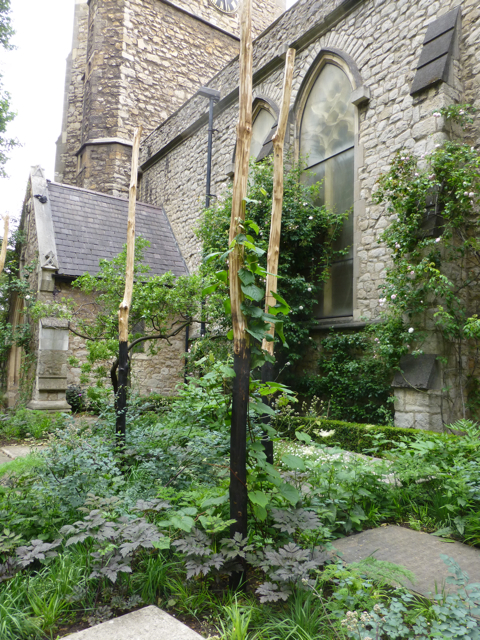 She was a little mystified by Pearson’s planting outside – charred poles up with vines and virginia creepers will romp by the autumn. It was a glorious semi wild filigree of leaves. And – in the notes – “the quaking grasses are positioned in places exposed to the wind from the Thames”. And that is Dan Pearson all over, The exhibition room was very dark – perhaps too dark for the senior visitor. We listened to Dan on video, expound the unfurling of his life’s vocation while behind us another video competed with rushing water and London traffic. My mother, 84 and introduced to Pearson for the first time, was entranced. 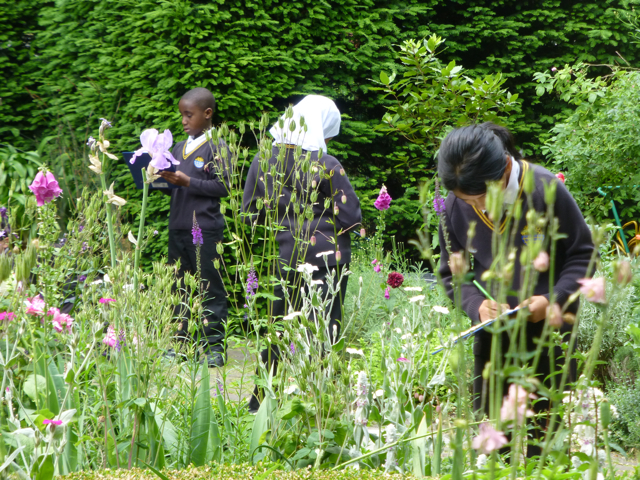 Outside there is a small knot garden where school children were swarming like industrious bees, hunting for the banana tree and making notes on clip boards. Thus museum is doing good work enthusing future gardeners. I like the fact that they are encouraging the next generation to be interested in plants and horticulture, maybe they will remember their outing to such a special place. Pauline I really hope so -lack of skilled gardeners is no longer shouting from the wings but taken the main stage as a big problem. Dan Pearson is one of the world’s most talented garden designers without a doubt.